More than half of those surveyed depend on food banks at least once a week. Prime Minister Justin Trudeau shakes hands with a Syrian refugee during Canada Day celebrations on Parliament Hill, July 1, 2016. VANCOUVER — Many Syrian refugees are struggling to find employment and afford life in Canada, but they are gradually settling in and still happy they came, advocates said. That's the picture painted by a small survey of 241 Syrian adults who arrived in British Columbia with government assistance over the past two years. Refugee settlement organizations across the country have reported similar challenges and successes for the nearly 52,000 Syrian refugees who arrived in Canada between October 2015 and February 2018. More than half of those surveyed depend on food banks at least once a week, although that figure dropped to 56 per cent from 66 per cent over the last year, according to the report by Immigrant Services Society of B.C. The full-time employment rate has doubled in the past year to 27 per cent, it said. At the same time, 87 per cent say their English has improved and 97 per cent say their children are doing well in school, the report said. Director of settlement services Chris Friesen said given the huge obstacles government-assisted refugees have to overcome to get to Canada, full integration will take longer than two years, so the figures paint an optimistic picture. Government-assisted refugees are selected based on vulnerability, he said. Many spent at least three years in refugee camps and experienced trauma. They tend to have less education, fewer skills, more medical conditions and a weaker support network than privately sponsored refugees in Canada, he said. "Everyone we talked to is determined to give back to this country and the way they can do that is by learning English as quickly as possible, getting a job and paying taxes. That, they see, is their responsibility, and they will go miles to make that happen," Friesen said. The survey also helped highlight some gaps in support, he said. Some refugees are on wait lists for English-language classes and some need clinical interventions for the trauma they experienced, he said. The report says 11 per cent of those surveyed said their families were depressed and 62 per cent of those same respondents said their emotional health declined over the past year. Fariborz Birjandian, CEO of the Calgary Catholic Immigration Society, said given the massive life change that refugees are undergoing, full settlement and integration shouldn't be expected immediately. He said some refugees are beginning to adapt to the different family culture in Alberta, especially in terms of new dynamics where women have more rights. 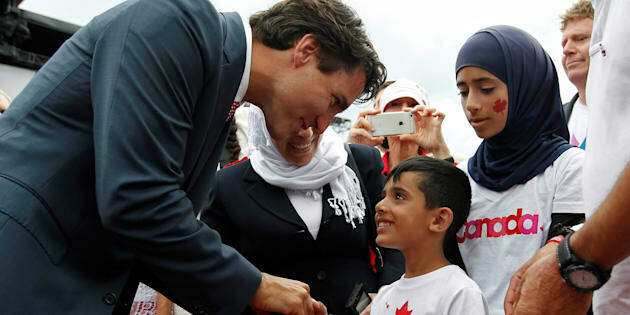 More than 65 per cent of government-assisted refugees who arrived in Canada are under 17 years old. They tend to learn languages and adapt to new cultures more quickly than adults, so they are playing an important role in their families integration, he said. "Once they start doing well, the parents will benefit from that," he said. Christine Youssef (Third from left) and George Hababeh (far right) sponsors of the Obeid Family, among the first Syrian refugees to arrive in Canada, watching from courtside during the warm-up before the game between the Milwaukee Bucks and the Toronto Raptors at Air Canada Centre. In Toronto, many refugees are expressing frustration that they can't find work, said Mario Calla, executive director for COSTI Immigrant Services. "They're finding learning English is not coming as quickly as they had hoped for and they're anxious to work," he said. Frustration is normal and it takes patience to find your place in a new country, he said. "What we're experiencing overall is what we would expect for any group," Calla said. Unlike some other refugee groups, he said Syrians have found a strong support network in Toronto because of the huge numbers who settled there. Toronto has the highest influx of Syrian refugees since October 2015, at about 22,000. In Nova Scotia, one challenge has been finding housing for some larger families, while another has been finding supports for refugees with disabilities, said Jennifer Watts, CEO of the Immigrant Services Association of Nova Scotia. She said support programs to integrate refugees into the work force and promote community connections are widely successful and continue to shift as new needs arise. "This is about continually adapting and understanding what the needs are," Watts said.